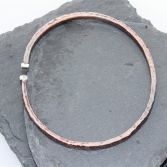 Copper & Silver Hammered Bangle/Cuff is made from 4.0mm thick copper wire which has been hammered to give it a flat and wider face. It is annealed (heated until it glows red) a few times to enable me to add textures to the surface and get a flatter face, i then solder on 2 solid sterling silver rectangles to each end. 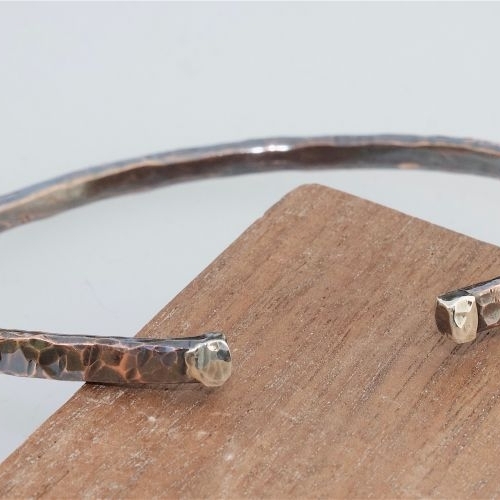 The Copper & Silver Hammered Bangle is then given a high polish and a patina is added to give depth and colour which highlights the beautiful textures. 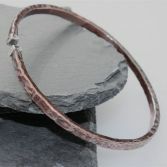 This bangle is a man's size medium and should fit most male wrists as it is an open bangle and oval in shape and there's a bit of give in it making it easier to get on. Other sizes can be made to order, but please allow 3-4 days from date of ordering. Please email me for lager sizes. Please note that due to the handcrafted nature of the bangle no two bangles will be completley identical, however the images shown are a very good representation of the bangle you will receive. 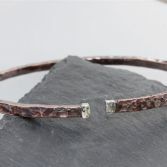 Copper has a beautiful warm quality and is renowned for it's healing ability and often worn to alleviate the symptoms of arthritis so it looks fab and provide healing. 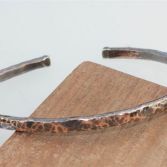 Your Copper & Silver Hammered Open Bangle will be presented in a gift bag bubble wrapped and place in a padded envelope and posted via Royal Mail 1st class delivery (signed for) to any address within the UK free of charge. If you wold like gift box then please let me know.